Huawei's flash arrays have done well in a SPEC filer benchmark, Pavilion has brought out an NVMe-oF array with 20, yes 20, controllers, Nutanix is growing, and OEMs are reportedly feeling the DRAM pressure. It's your week in storage. These are just a few of the news nuggets encountered in our weekly voyage through the storage galaxy as dealing with data sprawl, flash and NVMe-oF increasingly become centre-stage items. Startup Aparavi, which has several ex-Novastor people among its number, has gained $3m funding from a Swiss VC to develop its cloud archive software. This is focused on archiving zillions of small files in on-premises object storage systems (Caringo, Cloudian, Scality, Wasabi) or the public cloud using an open data format. The idea is to be able to switch from one archive repository to another and have a multi-cloud active archive, such as one spanning AWS and Azure; both supported in the initial SaaS-based software release. Archived data is pruned to remove redundant files and redundant portions of files to save space. The software provides multi-tenancy and multi-tiering, and service providers are a sales target. Aparavi is not a cloud broker and customers need to make their own target repository arrangements; either on-premises or in the public cloud. Marketing head Jonathan Calmes said image-based backups face GDPR compliance problems whereas Aparavi's Active Archive-as-a-Service (AAaaS) doesn't. The initial supported geography is North America. Off-the-shelf SSDs can be a poor match with three-digit and up drive workloads – so hypescalers build their own controllers and buy at the flash chip level instead. Amazon, Facebook, Google, Microsoft and the like can afford to do this, ordinary businesses cannot. The costs of developing an ASIC controller and firmware and mounting chips on a base board are too high. Startup Burlywood has said its TrueFlash modular controller design can offer a solution for businesses needing similarly customised drives for similar workloads (multiple hundreds of drives and up), which can then afford them more easily with its customised Xilinx UltraScale+ FPGA-based reference designs called TrueFlash. Burlywood claimed customers could qualify multiple NAND types using the same controller in weeks instead of quarters. CEO Tod Earhart has storage controller technology experience from his time at Western Digital (HGST) and Micron. His CV extends back to InPhase and its holographic storage. He said the error detection and correction problems encountered when reading from holographic disks are similar to those met when reading data from flash. The development engineering team said hyperscale-type deployments using commodity SSDs over-buy drives to get the performance and endurance characteristics they need. If they could have SSDs tuned to have better-levelled and balanced read and write characteristics, they would save significant amounts of cash in buying SSDs, their SSDs would last longer, and they would also have better-performing systems. Cloudtenna has come up with a file search portal to fix multi-silo'd file-search issues. It said its DirectSearch cloud service product for businesses scans all your file storing locations – on-premises, cloud file storage services, and hosted/on-line applications – creates an index (metadata) and then uses in-memory processing to run fast searches of your individual file universe. 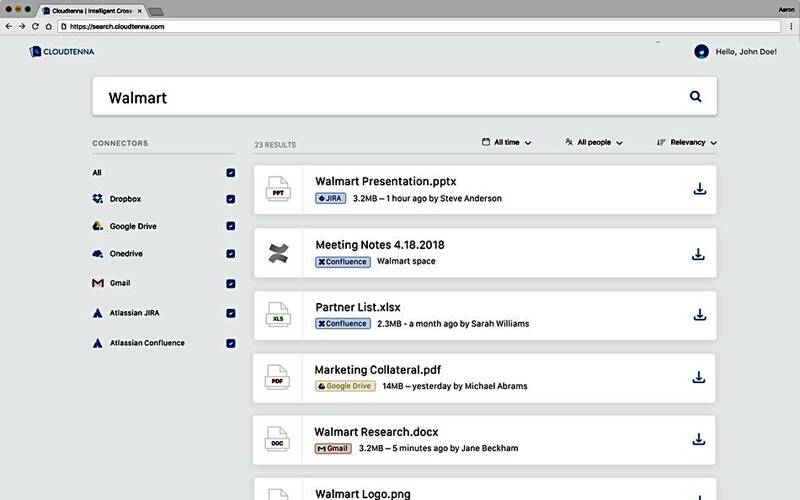 You run a search on a topic, such as "Walmart" and it returns a list of files with that text string in their name or contents. Cloudtenna was started in 2013 and has just received $4m seed funding plus a contribution from strategic investor Citrix. That's a longish time between startup and seed funding dates. Its software's task is to first compile a list of a business's files, their attributes and contents, second to watch their access patterns and content changes, and, third, to respond to search requests. The company started out using Hadoop to construct the metadata needed by its likely business customers. An issue was building a central index and restricting search areas to files individual users had permission to see, using Access Control Lists (ACLs). It took ages to crunch the file permissions with Hadoop. Cloudtenna then wrote different code using in-memory processing and Spark to get the speed it needed. Off-the-shelf Elastic Search is not used. It stores its indices in the Amazon cloud but also uses Google to safeguard data availability. Machine learning techniques are used, with reliance on content and user access graphs, to produce personalised search results for every user. These recognise that if your boss accessed a file, it's probably an important file for you too. There is also a personalised auto-complete function similar to Google Search that comes into play when you start entering a file search string, based on files a particular user has accessed. The file source silos are accessed using connectors and their state is monitored using web-like crawlers for each source, which update the index. These scans are done ignoring ACL restrictions. If you scan per user, being guided by their ACL entry, that is much slower than running a single scan; many hours could be needed. Instead a shared folder is scanned once then user data access is restricted using ACLs. DirectSearch is the first of a set of products that could provide e-discovery, audit trails, governance and compliance functionality. The machine learning can also be used to detect unlikely and/or unusual file access patterns. Huawei has a overtaken everyone except the WekaIO/Supermicro pairing in the SPEC SFS2014 NAS benchmark. This tests the performance of filers and we're looking at the number of software builds completed in a run and the overall response time (ORT). Huawei's system came between the previous second-best and best results. An E8-Spectrum Scale system achieved 600 builds and an 0.69 sec ORT. WekaIO, using Supermicro servers, did 1,200 builds with a 1.02 sec ORT to beat that. Huawei failed to match that, with 1,000 builds, but did record a record low ORT of 0.59 secs. The company said: "According to test data, Huawei's OceanStor 6800F V5 is leading its competitors, performing nearly twice as well as peer products in enterprise NAS performance." The firm has said that it does not class WekaIO as a peer product. But it is NAS and SPEC has validated it as an SFS2914 performer. Huawei told us that, according to IDC's China Quarterly External Disk Tracker 2017, its own NAS ranks first in China. Nutanix's Q3 fiscal 2018 (ended April 30) revenues were $289.4m, up 41 per cent from a year ago. Net loss was $86m, up from $97m a year ago. Chairman, founder and CEO Dheeraj Pandey said that some 820 new customers came on board in the quarter, taking the total to 9,690. Software and support billings growth was 67 per cent year-on-year. "One thing that has been really going on well for us is during the transition we have not pissed off our OEM partners," Pandey told the earnings call. The CEO later added: "We can also virtualize the NVMe over fabric protocol to be hyperconverged ... you can have apps not going through NFS, which was the tax that we had to pay for hypervisors." So SANs using NVMe-oF won't get a performance jump on Nutanix HCI systems. William Blair analyst Jason Ader said: "The next milestone for the company will be to deliver on its one-click, hybrid cloud vision, which we believe is likely to be apparent in calendar 2019." NVMe-over-Fabrics storage array supplier Pavilion, which has passed through exec changes and some restructuring, has announced a second round of funding, amounting to $11m, we think, though Pavilion isn't saying, taking total finding to $33m. The company has two new investors: Korea Investment Partners and DAG Ventures. Existing investors Kleiner Perkins Caufield & Byers, Artiman Ventures and SK Telecom also participated in this round. The cash will be used to expand its global customer base, increase its product offering, and strengthen sales and marketing. Pavilion has just announced a rack-scale NVMe-oF storage array, four years after it was founded in 2014, claiming it's the first first NVMe-oF storage array for rack-scale modern applications, as opposed to what it claims are retro-fit NVMe-oF arrays like Dell EMC's PowerMax. It uses a 4U chassis with up to 72 x 2.5-inch NVMe drives, in 4 banks of 18 drives, with 14TB to 1PB of capacity – meaning 13.9TB drive capacity max. It says it has up to 30 GB/s per RU (120GB/sec/chassis) and up to 40 × 100 GbitE ports per 4U chassis. This array has a 117μs average read latency, and delivers up to 20 million 4K read IOPS from, wait for it, up to 20 active:active controllers – in the chassis and hooked up to the PCIe fabric. Twenty controllers – huh? The controller CPUs each talk, via PCIe, to a storage media pool. Pavilion's product head Jeff Sosa told us: "These are Intel Broadwell SOCs, which are lower power than typical x86 CPUs. They make up 20 active:active controllers, each with their own memory and copy of the OS. There are also two redundant supervisor modules that handle the control plane and management functions for the entire system. "We package the controllers on a modular IO Line Card, which contains two CPUs and four network ports each. You can package up to 10 IO Line cards, plus the two supervisor modules, in a single chassis. "The system's modularity allows customers to deploy the required amount of controllers and SSDs within a single chassis as needed to meet specific application performance and capacity requirements. You can also expand this over time within a single chassis as requirements change, by adding SSDs and/or additional IO Line Cards, which are automatically incorporated and deployed by the management software." Pavilion said commodity components are used throughout, with no ASICs or FPGAs, and the NVMe-oF is courtesy of ROCE over 40 or 100GbitE. The system has dual-parity RAID protection, thin-provisioning, and zero-space instant snapshots and clones. There is a REST API, SNMP, and Active Directory integration. The arrays have built-in telemetry which sends data to a cloud analytics facility. Pavilion made no mention of deduplication or compression. It stressed its deployment needs no customer software on accessing servers; a dig at Excelero and others. Hyperconverged systems vendor Pivot3 has partnered with CloudEndure to enable any workload on its systems to migrate to AWS, Azure and Google Cloud and back in a few steps. We're told CloudEndure provides disaster recovery and automated migration of applications with near-zero downtime and no data loss. Its live workload mobility technology provides continuous block-level replication and application stack orchestration at the touch of a button, within minutes, and with the latest data. Pivot3's new cloud workload migration and disaster recovery capabilities are available now. Following its CEO change and exec departures, Reduxio got in touch to tell us the core Reduxio founders, CTO Nir Peleg and Research VP Amnon Strasser, are still in place, as are other executives, including the VP of finance, chief architect, marketing heads and so forth. Support, QA and other functions are still in place. The company is in the midst of raising fresh capital from its existing investors who approved the changes. It has more than 200 customer deployments and says it's going to double down on innovation. Reltio has secured a $45m Series D investment to accelerate innovation, fuel international expansion, and ramp support for global enterprise customers. It has raised $117m in total. CEO Manish Sood said: "Data must be at the heart of every business decision, but most companies can't take optimal advantage of it because their data, technologies and people are siloed." Reltio's Self-Learning Data Platform gives companies an organised single foundation of reliable data, which it claimed leads to better collaboration, personalised views and guided intelligent recommendations. Toshiba Memory Systems, en-route to being sold to a Bain-led consortium, has formally said it has decided to start work on the new flash fab in Kitakami, Iwate prefecture, by July this year. The new fab, which will be part-funded by Western Digital, will be completed in 2019 and build 3D NAND. Its production system will use artificial intelligence to boost productivity. In another recent change Robert Klusman became NetApp director for HCI solutions and marketing in April 2018. He's another SolidFire vet. As a reminder NetApp bought all-flash array startup SolidFire for $870m in December 2015. The SolidFire-based HCI product was launched in June last year. AOMEI is releasing AOMEI Partition Assistant Free and AOMEI Backupper Free for GDPR Compliance, which don't contain any information tracking and/or collecting program. More information here. Download AOMEI Backupper Free for GDPR Compliance here and AOMEI Partition Assistant Free for GDPR Compliance here.